December 28, 2015: Renault will reportedly showcase the clutchless AMT and 1000 cc versions of the popular Kwid at the upcoming Expo in February 2016. We always knew that Renault will be updating its entry-level hatchback by swapping the 800cc, 54bhp motor for a more powerful 1.0-liter power-plant. But in addition, the power-packed Kwid will also incorporate premium safety features like ABS and Airbags. 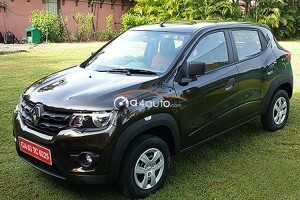 The upgraded Kwid will come with safety features that will include ABS and dual-front airbags. The 1.0-liter Renault Kwid might also feature an Easy-R AMT gearbox, in addition to the updated safety equipment and a gruntier powerplant.